The 2010 Paris Motorshow will see the Octavia Green E Line concept. Skoda's first-ever electric-powered vehicle will demonstrate the company's innovative potential and technological competence in this growing area. The first fleet of test vehicles is planned for 2011. Mobility for people and clean cars for the environment – these are Skoda's commitments. Mobility without emissions is the future. “The Octavia Green E Line embodies the values of the brand absolutely perfectly - the vehicle combines the desire for individual mobility with our environmental goals”, said Skoda Auto BOD Chairman Prof. Dr. Winfried Vahland. 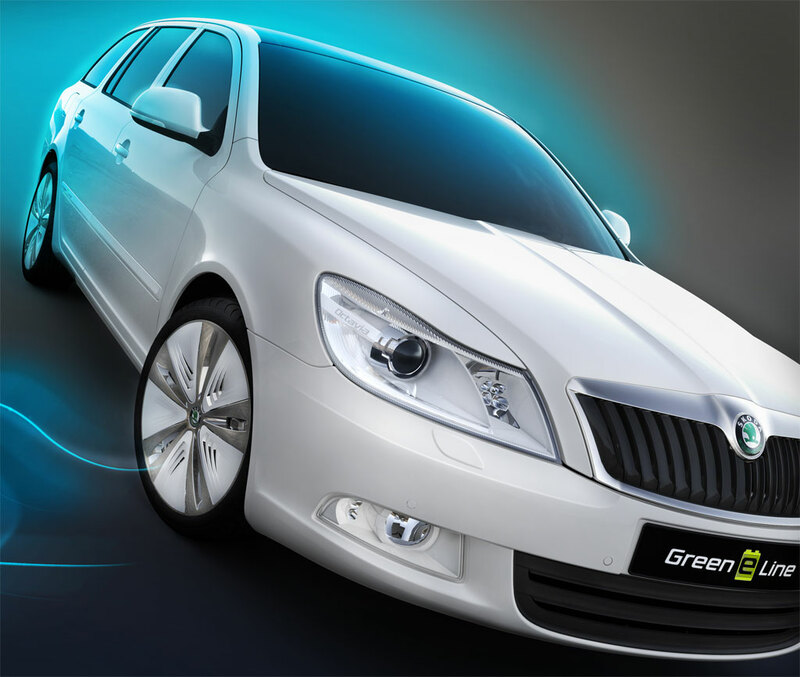 The Green E Line concept is based on the Skoda Octavia Combi. With its modular chassis design, this series-production car is the ideal option in terms of arranging the batteries, electronic control units and the electric engine with its constant power of 60 kW and max. power of 85 kW. Available right after the start (as is typical of this type of drive), the maximum torque of 270 Nm gives the car enough power for sharp acceleration and a good amount of agility and responsiveness, which the driver will appreciate mainly in busy city traffic. The Octavia Green E Line accelerates from 0 to 100 km/h in just twelve seconds, and the car's maximum speed is limited to 135 km/h. The electricity for the Octavia Green E Line is supplied by a modern lithium-ion battery. With a range-per-charge of 140 kilometres, the Skoda Octavia Green E Line comfortably meets the requirements of most everyday commuters in Europe. Located under the middle and rear parts of the floor and extending partly into the luggage compartment, the 26.5 kWh battery is made up of 180 lithium-ion cells (diameter 150 mm, length 650 mm) and weighs about 315 kilograms. However, the battery has almost no impact on the volume of the passenger and luggage compartments. The Octavia Green E Line is fitted with five comfortable seats, and its passenger compartment is identical with that of the Octavia Combi with a combustion engine. The look of the Skoda Octavia Green E Line conveys the environmental-friendliness of its electric drive.Pearl-white exterior colour and elegant chrome-trim on both the front and rear of the vehicle as well as on the wheels create an impressive contrast with the glossy black roof with integrated energy-generating photovoltaic panels. Skoda Auto is planning to create a test fleet of Octavias Green E Line in 2011 with the objective of obtaining additional information relevant to the further development of the electric drive.